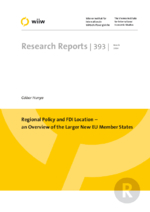 The paper compares three countries (Hungary, Poland and Romania) in terms of the number of greenfield FDI projects and of GDP by NUTS-2 sub-country regions. We discuss whether the particular regions received a smaller or larger share of projects than their share in GDP. Then we outline the regional and investment policy tools applied in each of the countries, looking at their possible impact on the location choice of investors. The investigation reveals significant regional gaps in attracting new FDI projects and a dominance of the capital cities. Regional discrepancies between NUTS-2 regions in terms of per capita GDP have become marginally smaller in recent years but were mainly unrelated to the location of new foreign investments. State aid for large investments, industrial parks and special economic zones has been among the most powerful tools directing the location choice of new FDI projects.